The school’s break is over. The weather is freezing–even here in Florida! The kids are stuck inside. Sound familiar? Then I have just what you are looking for! The 100 Acts of Kindness Project! Why Join The 100 Acts of Kindness Project? Doing acts of kindness is the best and easiest way to connect with your kids. Even if you aren’t stuck inside and going stir crazy this month doing acts of kindness is a great way to kick off the year. My co-host, Kristina from Toddler Approved, and I always say that no act of kindness is too small. And it’s true. Even the smallest act can change someone’s day and make a difference. You will never really know how far your act of kindness reaches. So just imagine how much of a difference 100 acts of kindness by ALL of us will make! How Do I Participate in the 100 Acts of Kindness Project? Commit to doing 100 acts of kindness. By yourself, with your family, with your class, with your friends, with your neighborhood, with your school–whatever you choose! Join the 100 Acts of Kindness Facebook group. It’s already full of hundreds of people like you wanting to spread kindness. Introduce yourself, cheer each other on, share ideas–make the group your happy place full of kindness and hope! Decide how you and your family or group are going to keep track of your 100 acts of kindness. I have a fun recording sheet below you can use! There is no right or wrong way to do it and EVERY act of kindness “counts”. There is no act that isn’t “kind enough” for this project. Do acts of kindness! Between January 15, Martin Luther King Jr. Day, and February 14th try to do 100 acts of kindness together. 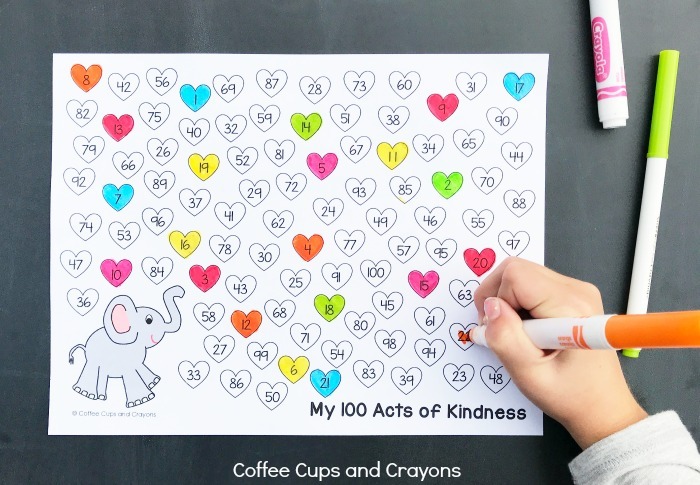 I have a list of 100 Acts of Kindness for Kids to get you started! Celebrate your good work. On Valentine’s Day or whenever you finish have a celebration of all the acts of kindness you have done. We’ll be there in the Facebook group and on Instagram sharing our own acts of kindness and cheering you on too! Follow the hashtag #100actsofkindness on Instagram to see what others are doing too! I’m @coffeeandcrayon and Kristina is @kristinatoddlerapproved! Quick note that we have to add you all individually so don’t be worried if you aren’t approved right away! We promise we’ll get to it as soon as we can. There are so many different ways you can record your acts of kindness. Kristina has a super cute kindness tree idea and bingo card, we’ve done chain links and blown up 100 balloons, others have done hearts on bulletin boards–anything goes! 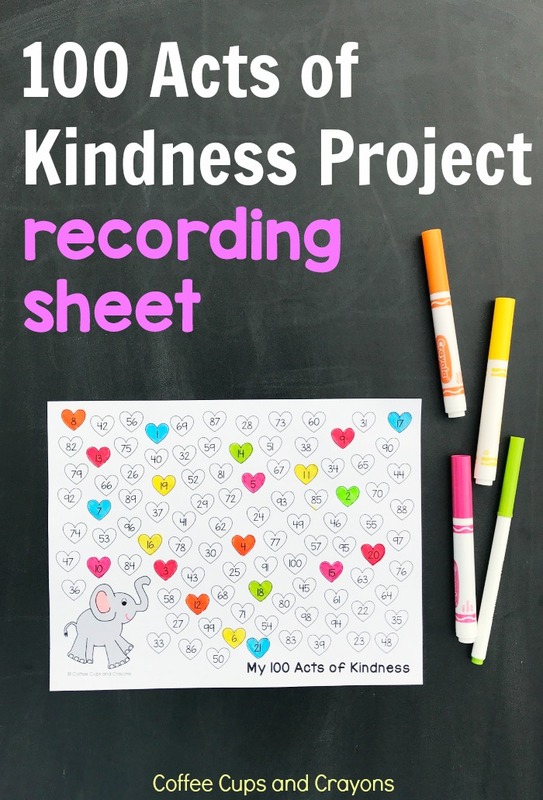 This year as a special gift for anyone joining in with the 100 Acts of Kindness Challenge we have a set of super adorable free printable recording sheets! There’s a free printable 100 acts of kindness recording sheet for everyone! Looking for some kindness ideas to help you with the project? Here you go! 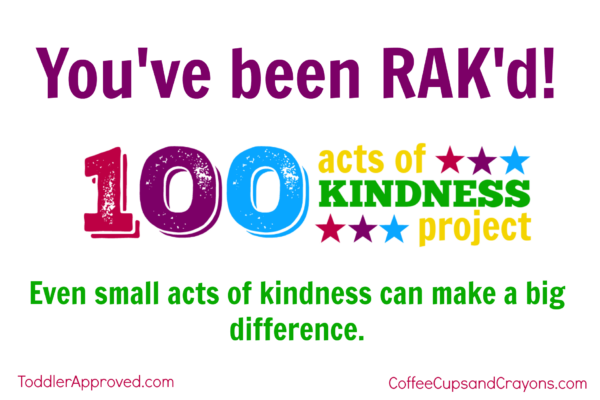 Free Printable RAK’d (random act of kindnessed) cards you can hand out as you do acts of kindness. These are great for leaving with gifts or food you give to others, on someone’s door if you shovel their sidewalk, etc. Go to this post to download and print them! 2. 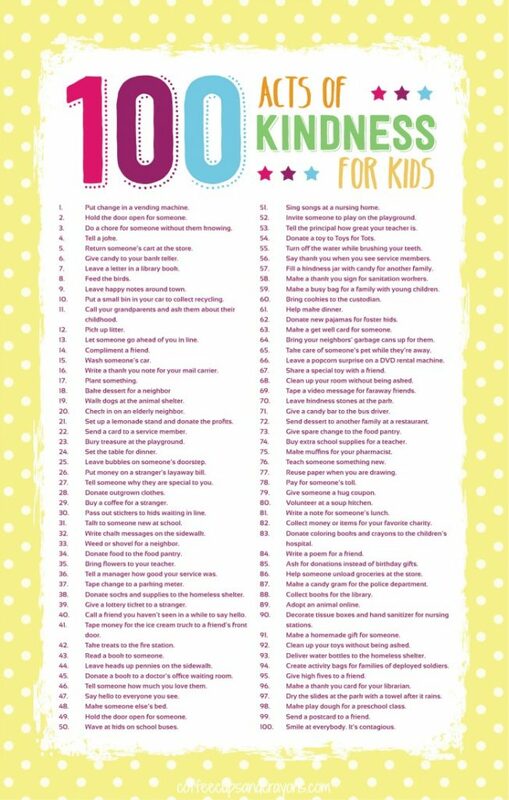 Printable list of 100 Acts of Kindness for Kids. This list has LOTS of different types of kindness acts that you can do with your kids or class. There’s even a free printable in the post you can print for your refrigerator. 3. The 100 Acts of Kindness Project Facebook Group. Our FB group is full of parents and teachers sharing the ideas and photos they are using with their children. It’s a happy place to get ideas and be inspired by each other. Let’s make a difference in 2018 together!